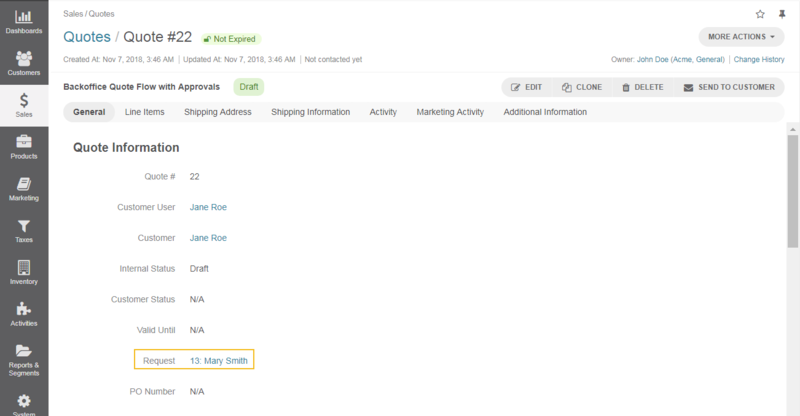 In OroCommerce, non-authenticated customer users can request a quote for the products they are interested in. 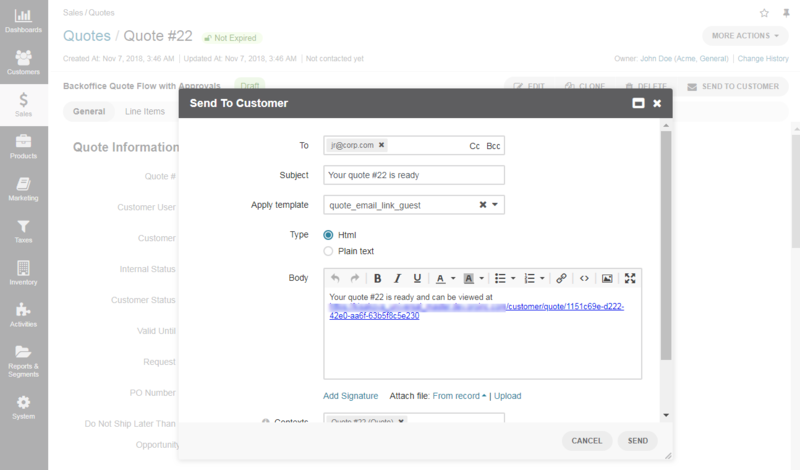 When the sales representative processes the request and creates a quote in the management console, buyers can access the quote via a unique direct link through the email. Once a guest customer user submits an RFQ in the storefront, this RFQ appears in the management console. Navigate to Sales > Requests for Quotes in the main menu. Click once on the required RFQ to open its page. Click Create Quote on the top right. Amend quote details as necessary, and click Save and Close once done. The new quote is linked to the original request, which is displayed in the Quote Information section. Click Send to Customer on the top right. In the displayed form, the template to be applied is by default set to quote_email_link_guest and the link to the guest quote is provided in the text body. Click Send to email the quote to the buyer. Once the email is sent, the link is displayed in the Quote Information section in the Unique Guest Link field. The link is added to the Quote Information section only when the quote’s internal status is transitioned to Sent to Customer. To view the quote, click on the link. If the quote expires, you will no longer be able to submit the quote via the link. When the customer submits the quote and completes the checkout process, you will receive their order details in the management console. The existing quote workflows, their steps and transitions in the management console work the same way for guest quotes.